I’ve been looking at my games collection recently and I suddenly realised that I have an absolute tonne of dungeon crawls. Driving to work this morning I had the thought that if I wanted to cull any of my gaming collection it might be a good place to start. First things first, there is no way that I would get rid of my copy of Heroquest so that’s completely off the table. It was one of the first games that I had as kid and I still love it to this day. 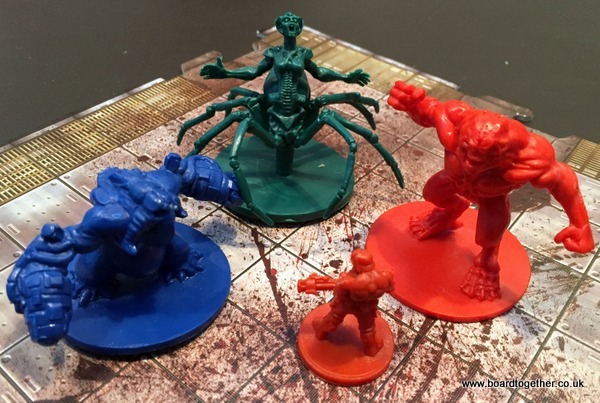 The one and only HeroQuest… Unless you count the Kickstarter version, yeah that one. 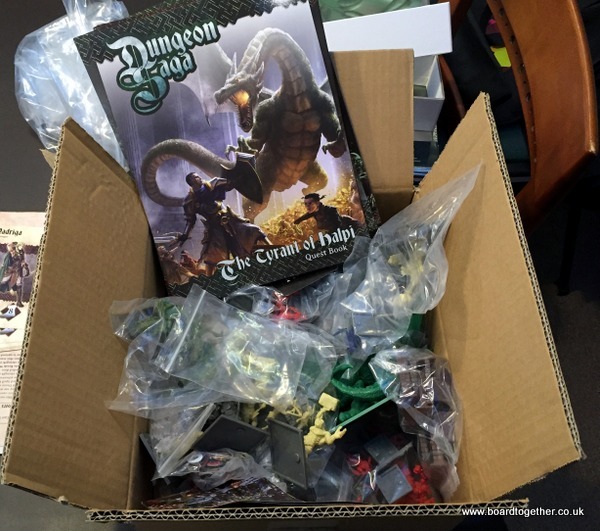 So let’s take a look at the other Dungeon Crawl type games in my collection. 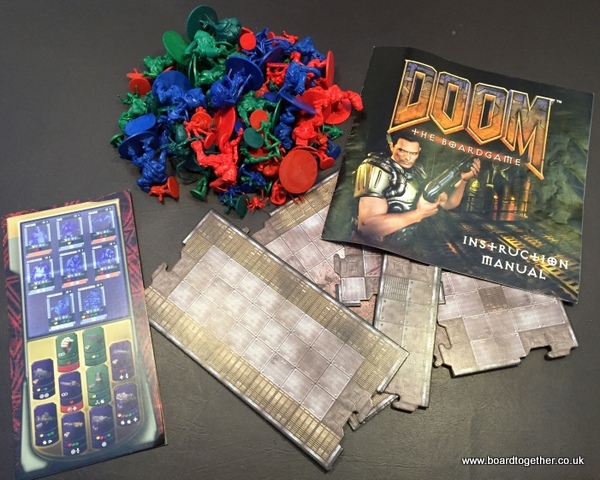 The magnificent DOOM the board game. Who doesn’t remember the original PC game Doom. The first FPS that I ever played and the one that spawned a massive amount of clones. Granted Wolfenstein came first but Doom was an outstanding game. 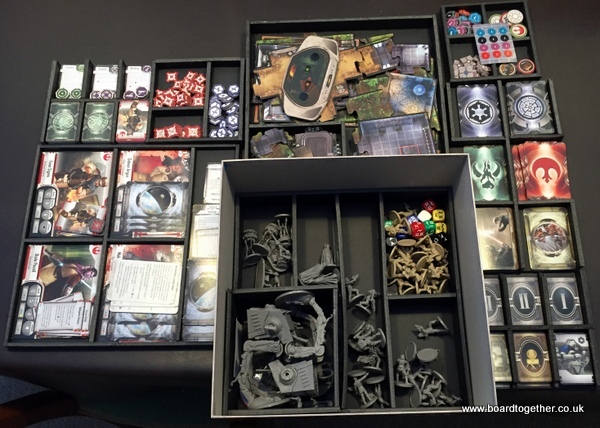 No surprises that it spawned a fantastic board game. Steeped in the world of Doom, players fight on Mars against a hordes of Hell spawn over a multitude amount of adventures. Then the expansion added more missions, Deathmatch and capture the flag modes to extend the life of the game. This game always gives my group a laugh even when we’re not playing it. Stories of one player who just opened doors and released a multitudes of demons upon the players has become a thing of legend. Organisation that the key to a good nights gaming with Dungeon Crawls. 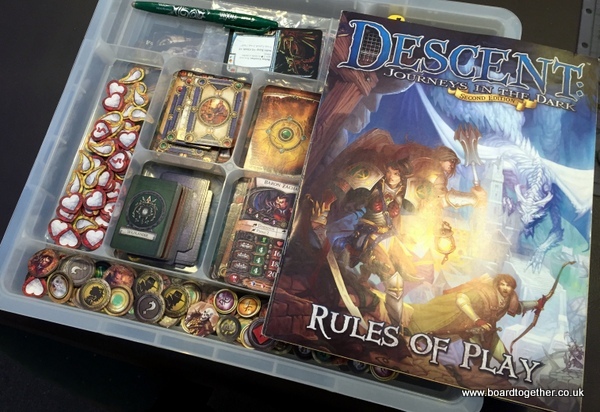 Descent first edition is a classic and the amount of miniatures in the core set plus the expansions is just amazing. The second edition expanded on the rules but I’m still more a fan of the first edition. 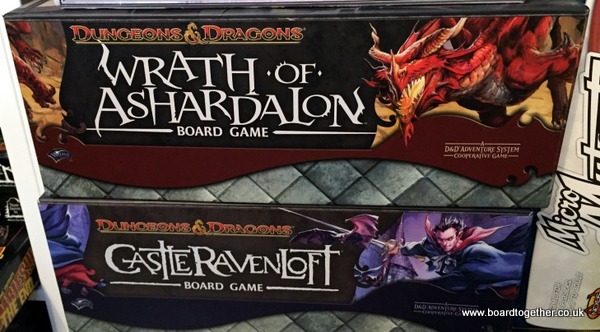 Based on the same board game system as Doom this is set in a fantasy world where monsters roam the land. Tonnes of adventure and then the road to legend expansion added campaign play where heroes gained experience and grew as characters. Items could be brought at towns and then back into a dungeon to get more loot. Space Hulk! Awesome box of Awesome! Games Workshops classic game was re-released recently and it was one of the big two when I was growing up. Heroquest was the other one but I actually picked that one up at the time. 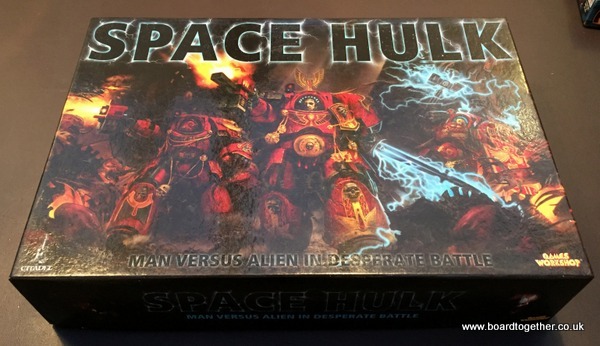 For Space Hulk I had to wait until the new edition before I could get my hands on it. To be completely honest I’ve not played a great deal of the game. But my goodness the components in this game are beautiful and the embossed, thick map tiles are something to behold. 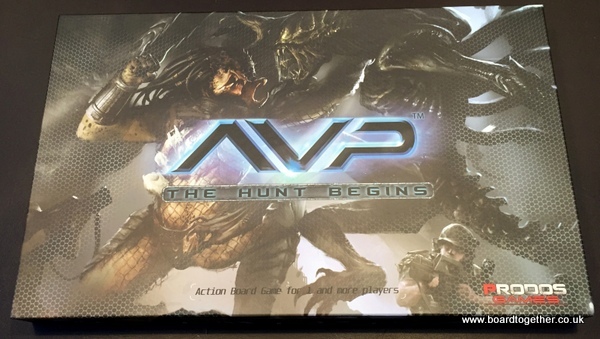 Alien vs Predator the hunt begins. Took a long time to come to stores and some of the people who kickstarted it are still waiting. 6 meters, that cant be right that’s in the room…. Oh! 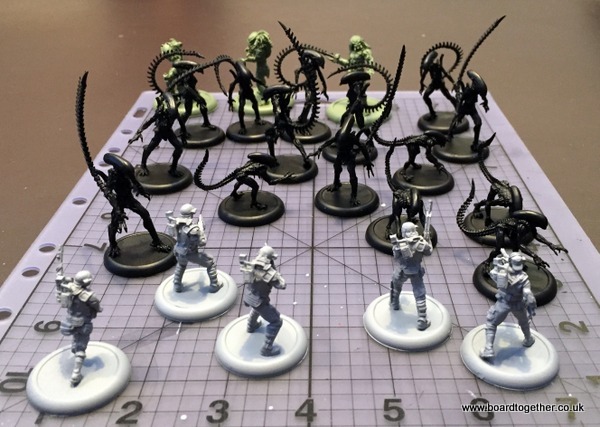 Aliens, Predators and Marines in a battle for supremacy on a derelict space craft. 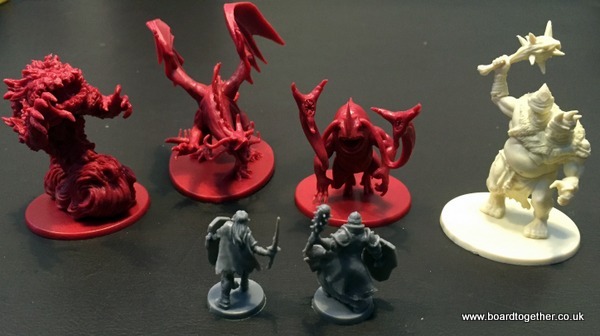 Great miniatures and components but a troubled history as Kickstarters go. Years of waiting for FOX to agree licensing, hell even the cardboard tokens for fans have FOX stamped on them. Frustrated backers who are still waiting for their items to turn up in the post whilst the game’s on sale in shops has created a lot of frustration. There’s also reviews on YouTube about the game not being balanced properly and that the Predators are a bit OP. This is a great little game. My latest purchase in this Dungeon Crawl battle for space. 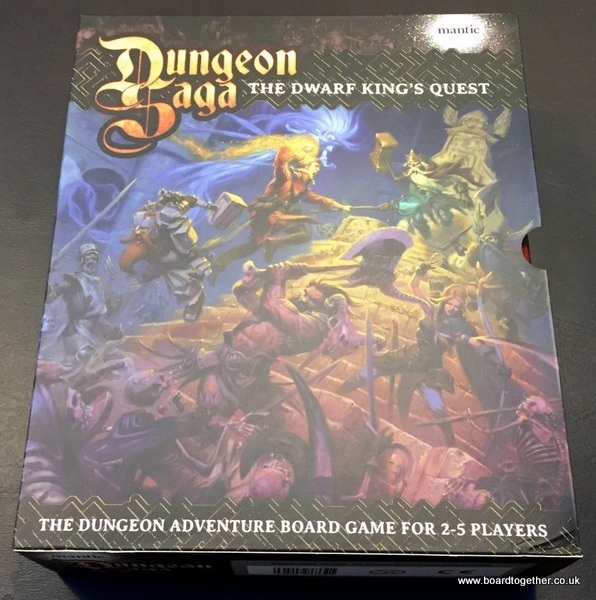 If you’re interested in seeing what I thought of Dungeon Saga look at my post here. Fun and simply to play but a great game if you don’t want to click the link. Descent set in the Star Wars universe with Heroes facing off against the Empire and all your favourite characters, Han, Chewy, Luke and Darth Vader can play too. Campaign play is achieved by linking adventures or adding different missions if you are successful or not. Add the ability to play a miniatures battle game on top and this is a must own game, especially if you are into Star Wars. Haven’t got this one to the table… yet. Older D&D Dungeon Crawl… Still awesome. …There’s also the new Kickstarter Conan game coming as well. Darn it. . .